In addition to his flight over Palm Beach in 1911, John Alexander Douglas McCurdy flew similar demonstrations in Daytona and Key West. Seaplanes utilized the dock in front of the Royal Poinciana Hotel as a point of departure.Courtesy of Historical Society of Palm Beach County. 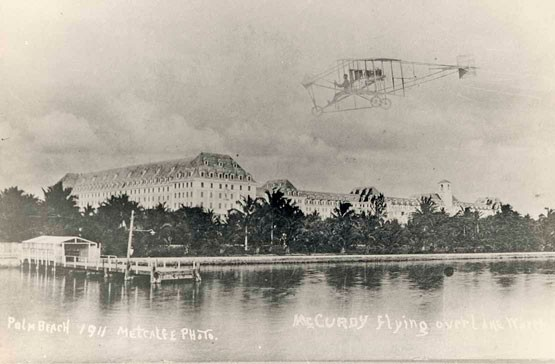 In 1911, John McCurdy brought a Curtiss plane to Daytona, Key West and Palm Beach for demonstration flights. During McCurdy’s flight over Palm Beach, the world’s first wireless message was reportedly sent from a plane to the ground. The following season there were several aerial yachts providing sightseeing rides over the island. That year, when R. A. Fanciulli crossed the Flagler bridge in a wheelchair, the toll collector insisted on collecting a toll from Mr. Fanciulli’s partner, Walter Brookins, who was flying one hundred feet above Fanciulli. During that season, hydroaeroplanes gave air shows along with the annual motor boat races on Lake Worth. With Palm Beach’s temperate winter weather, the government shipped the latest Curtiss hydroaeroplanes to Lake Worth for training by their air pilots, constructing a hangar on the west side of the lake across from Royal Park and south of the middle bridge. Mrs. Arthur Wright, a prominent winter visitor, proclaimed that “…when she was far beyond the water and land, she felt re-born and there was no sport that can prove its equal.” Mrs. George Jonas, the wife of Palm Beach’s mayor, became so enthralled she wanted to study aeronautics immediately, so she could fly “whenever the fancy dictates.” By 1916, several companies offered illuminated moonlight flights over Palm Beach for hotel guests from the east side of the lake.